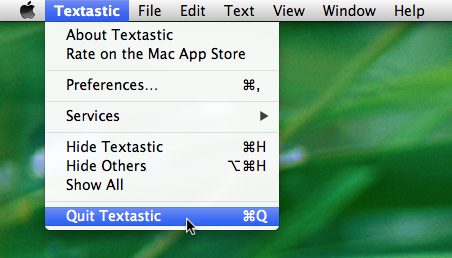 Textastic allows you to add your own custom syntax definitions and themes. 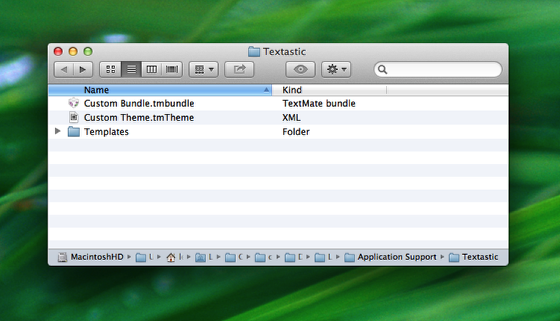 You can add TextMate-compatible .tmbundle packages and .tmTheme files. You can also add custom file templates. Copy your .tmbundle TextMate bundles and .tmTheme themes into the directory. Bundles and themes are loaded on application startup. Please quit and restart the app for changes to take effect. After you restart the app, new syntax definitions can be chosen from the status bar of a document. You can select added themes in the preferences screen. You can also add your own templates to the "New from Template" menu. To create a new template, select File → New from Template → Textastic → Template. Changes you save to template files will be automatically reflected in the New From Template menu without restarting the app. Table of Contents Next Lesson: Where can I ask questions, report bugs or suggest new features?